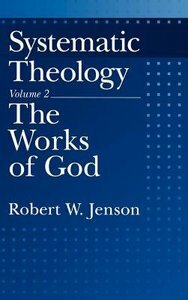 The concluding volume of Robert Jenson's Systematic Theology considers the work of God, examining the nature and role of God and God's works of creation. - Publisher Systematic Theology is the capstone of Robert Jenson's long and distinguished career as a theologian, being a full-scale systematic/dogmatic theology in the classic format. This is the second and concluding volume of the work, and considers the works of God, examining such topics as the nature^and role of the Church, and God's works of creation. - Publisher Robert W. Jenson gives us the twentieth century's most accomplished systematic theology written in English. It has few peers in any language. It is concise without being trivial, learned but not inaccessible, ecumenical while still rooted in Lutheran confessions, and stunningly fresh and original in its approach to the major topics. No one at any level, whether advanced or neophyte, can fail to learn from this work or remain unchallenged by it. It is the consummate work of alifetime. About "Systematic Theology (Vol 2)"
Systematic Theology is the capstone of Robert Jenson's long and distinguished career as a theologian, being a full-scale systematic/dogmatic theology in the classic format. This is the second and concluding volume of the work, and considers the works of God, examining such topics as the nature^and role of the Church, and God's works of creation. Robert W. Jenson gives us the twentieth century's most accomplished systematic theology written in English. It has few peers in any language. It is concise without being trivial, learned but not inaccessible, ecumenical while still rooted in Lutheran confessions, and stunningly fresh and original in its approach to the major topics. No one at any level, whether advanced or neophyte, can fail to learn from this work or remain unchallenged by it. It is the consummate work of alifetime.